The Sacraments are given to use not just as a symbol of our faith or an act of obedience. Rather they are given so that we can objectively know what God’s will is toward us. The Sacraments do something. They strengthen faith and deliver grace. They are God’s Word attached to a physical means. We are not to treat them as magic or as something to do just because we are supposed to. Rather they are given to us as sign and seal of our faith. Christians should use the Sacraments instituted by God. They are given for our good and faith is fed by them. 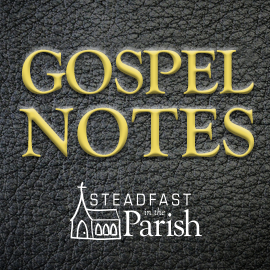 Our deeds and love of neighbor do not increase our faith but rather the Gospel applied to us causes our faith and love to grow (2 Thessalonians 1:1-4). The Sacraments are the most immediate and direct application of the Gospel and thus are needed for faith to grow and flourish. Faith is essential in the use of the Sacraments. Without faith, the Sacraments are not beneficial and in fact, can cause harm as in the case of the Lord’s Supper. The Reformers use the Latin phrase ex opere operato, that is by the work worked, to describe the Roman Catholic view of the Sacrament. It was believed that simply by doing the Sacrament you gained the benefits—faith was inconsequential. However, the outward motions of the Sacrament are not enough. This is not magic or some sort of incantation to please God. Rather it is God’s Word attached to the elements. His ordinance makes it so. Faith apprehends this. In the case of Baptism, faith is created at the time of the Baptism. Thus without faith, it is impossible to receive any blessing from the Sacrament, even though the Sacrament is still objectively true. This is the case even if the Sacrament is rightly administered. Faith is necessary to receive the gift, else it is all in vain or can, in fact, do harm. The Confutation agrees with this Article but says there are 7 Sacraments not 2. Melancthon in the Apology explains the difference between the Lutheran understanding of Sacrament and the Roman Catholic understanding. It is this distinction that leads to the difference in numbering. 3] If we call Sacraments rites which have the command of God, and to which the promise of grace has been added, it is easy to decide what are properly Sacraments. For rites instituted by men will not in this way be Sacraments properly so called. For it does not belong to human authority to promise grace. Therefore signs instituted without God’s command are not sure signs of grace, even though they perhaps instruct the rude [children or the uncultivated], or admonish as to something [as a painted cross]. 4] Therefore Baptism, the Lord’s Supper, and Absolution, which is the Sacrament of Repentance, are truly Sacraments. For these rites have God’s command and the promise of grace, which is peculiar to the New Testament. 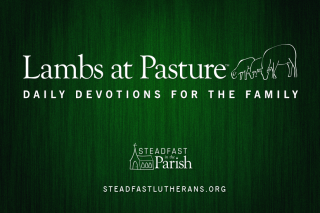 For when we are baptized, when we eat the Lord’s body, when we are absolved, our hearts must be firmly assured that God truly forgives us 5] for Christ’s sake. And God, at the same time, by the Word and by the rite, moves hearts to believe and conceive faith, just as Paul says, Rom. 10:17: Faith cometh by hearing. But just as the Word enters the ear in order to strike our heart, so the rite itself strikes the eye, in order to move the heart. 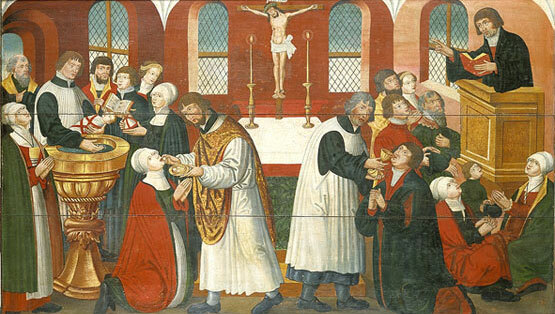 The effect of the Word and of the rite is the same, as it has been well said by Augustine that a Sacrament is a visible word, because the rite is received by the eyes, and is, as it were, a picture of the Word, signifying the same thing as the Word. Therefore the effect of both is the same. 6] Confirmation and Extreme Unction are rites received from the Fathers which not even the Church requires as necessary to salvation, because they do not have God’s command. Therefore it is not useless to distinguish these rites from the former, which have God’s express command and a clear promise of grace. 7] The adversaries understand priesthood not of the ministry of the Word, and administering the Sacraments to others, but they understand it as referring to sacrifice; as though in the New Testament there ought to be a priesthood like the Levitical, to sacrifice for the people, and merit the remission of sins for others. 8] We teach that the sacrifice of Christ dying on the cross has been sufficient for the sins of the whole world, and that there is no need, besides, of other sacrifices, as though this were not sufficient for our sins. Men, accordingly, are justified not because of any other sacrifices, but because of this one sacrifice of Christ, if they believe that they have been redeemed by this sacrifice. 9] They are accordingly called priests, not in order to make any sacrifices for the people as in the Law, so that by these they may merit remission of sins for the people; but they are called to teach the Gospel and administer the Sacraments to the people. 10] Nor do we have another priesthood like the Levitical, 11] as the Epistle to the Hebrews sufficiently teaches. But if ordination be understood as applying to the ministry of the Word, we are not unwilling to call ordination a sacrament. For the ministry of the Word has God’s command and glorious promises, Rom. 1:16: The Gospel is the power of God unto salvation to every one that believeth. Likewise, Is. 55:11: So shall My Word be that goeth forth out of My mouth; it shall not return unto Me void, but it shall accomplish that which I please. 12] If ordination be understood in this way, neither will we refuse to call the imposition of hands a sacrament. For the Church has the command to appoint ministers, which should be most pleasing to us, because we know that God approves this ministry, and is present in the ministry [that God will preach and work through men and those who have been chosen by men]. 13] And it is of advantage, so far as can be done, to adorn the ministry of the Word with every kind of praise against fanatical men, who dream that the Holy Ghost is given not through the Word, but because of certain preparations of their own, if they sit unoccupied and silent in obscure places, waiting for illumination, as the Enthusiasts formerly taught, and the Anabaptists now teach. 14] Matrimony was not first instituted in the New Testament, but in the beginning, immediately on the creation of the human race. It has, moreover, God’s command; it has also promises, not indeed properly pertaining to the New Testament, but pertaining rather to the bodily life. Wherefore, if any one should wish to call it a sacrament, he ought still to distinguish it from those preceding ones [the two former ones], which are properly signs of the New Testament, and testimonies of grace and the remission of sins. 15] But if marriage will have the name of sacrament for the reason that it has God’s command, other states or offices also, which have God’s command, may be called sacraments, as, for example, the magistracy. 16] Lastly, if among the Sacraments all things ought to be numbered which have God’s command, and to which promises have been added, why do we not add prayer, which most truly can be called a sacrament? For it has both God’s command and very many promises; and if placed among the Sacraments, as though in a more eminent place, it would invite men to pray. 17] Alms could also be reckoned here, and likewise afflictions, which are, even themselves signs, to which God has added promises. But let us omit these things. For no prudent man will strive greatly concerning the number or the term, if only those objects still be retained which have God’s command and promises. While many of these rites are practiced within our own churches, they are not considered Sacraments because grace has not been attached to them or they have not been ordained by God. They are still useful, even ordained by God as in the case of Marriage, but they are not Sacraments. Melancthon then goes on to point out the flaw in the Roman Catholic position. 18] It is still more needful to understand how the Sacraments are to be used. Here we condemn the whole crowd of scholastic doctors, who teach that the Sacraments confer grace ex opere operato, without a good disposition on the part of the one using them, provided he do not place a hindrance in the way. This is absolutely a Jewish opinion, to hold that we are justified by a ceremony, without a good disposition of the heart, i.e., without faith. And yet this impious and pernicious opinion 19] is taught with great authority throughout the entire realm of the Pope. Paul contradicts this, and denies, Rom. 4:9, that Abraham was justified by circumcision, but asserts that circumcision was a sign presented for exercising faith. Thus we teach that in the use of the Sacraments faith ought to be added, which should believe these promises, and receive the promised things, there offered in the Sacrament. 20] And the reason is plain and thoroughly grounded. [This is a certain and true use of the holy Sacrament, on which Christian hearts and consciences may risk to rely.] The promise is useless unless it is received by faith. But the Sacraments are the signs [and seals] of the promises. Therefore, in the use of the Sacraments faith ought to be added, so that, if any one use the Lord’s Supper, he use it thus. Because this is a Sacrament of the New Testament, as Christ clearly says, he ought for this very reason to be confident that what is promised in the New Testament, namely, the free remission of sins, is offered him. And let him receive this by faith, let him comfort his alarmed conscience, and know that these testimonies are not fallacious, but as sure as though [and still surer than if] God by a new miracle would declare from heaven that it was His will to grant forgiveness. But of what advantage would these miracles and promises be to an unbeliever? 21] And here we speak of special faith which believes the present promise, not only that which in general believes that God exists, but which believes that the remission of sins is offered. 22] This use of the Sacrament consoles godly and alarmed minds. Just doing the Sacrament is not sufficient to grant grace. Also the grace attached to the Sacrament cannot be transferred. Instead, faith is required on the part of the person receiving the Sacrament. In the end, the Sacraments are given for our comfort not to try to manipulate God like a sorcerer.